"The path of life is laid one Yellow Brick at a time." Every child deserves a safe place to learn. Parents know how important early education is for their child. Setting the stage for school, helping them develop and thrive in their early (and most important) years, providing a nurturing and structured environment — enrolling your child in an educational daycare is one of the best parenting decisions you can make. But one thing that’s absolutely essential for your child and their early education is something that’s also easy for you to implement at home: reading at home. This isn’t simply a way to help them develop their literacy skills, it’s a way to connect with them, and, to be frank, a way to give them the tools they need to be successful in every aspect of their life. Yellow Brick Road doesn’t like being called a daycare, because we’re so much more than simply watching your child while you are away. As an early childhood development center, we provide families living in Eden Prairie, Minnetonka, Maple Grove, or Plymouth with exceptional care and compassion while building a strong academic foundation. Promoting early literacy is at the core of so much of what we do. 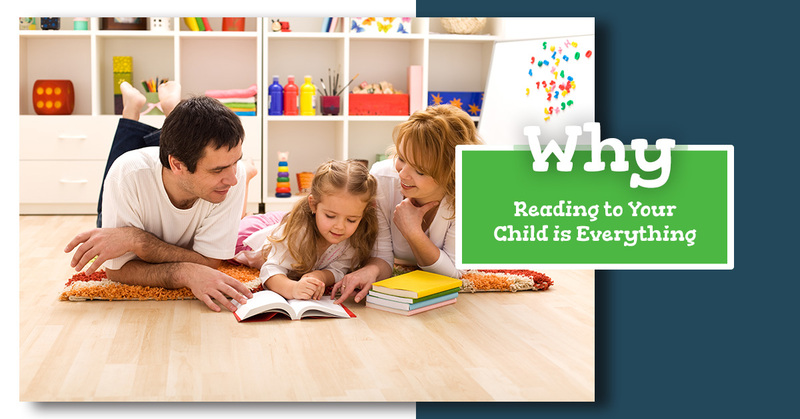 Find out why reading to your child is so important, and contact Yellow Brick Road to get the best in early education! The Washington Post wrote an article in which they said that “One of the most important things parents can do, beyond keeping kids healthy and safe, is to read with them.” Most parents know that reading is important, but it’s almost inconceivable that, after health and safety, it is one of the most important things in a child’s life. As another report showed, “the single most important activity for building knowledge for their eventual success in reading is reading aloud to children.” There are countless articles and studies that show that reading to children is an absolute necessity. But why is this the case? Reading aloud helps children develop their vocabulary. Hearing different words and having a bountiful vocabulary to reference helps children learn to use words on their own, and to begin communicating. With conversation and communication, children can begin forming relationships and positive social interactions. It’s difficult and frustrating to not be able to express oneself or to engage with others; building a child’s vocabulary from a young age counters this problem. Having the words to express how we’re feeling helps us better manage and regulate our emotions. Imagine being angry with someone or sad from a situation, and not being able to explain how you feel — even just to yourself. Building vocabulary makes it possible for children to advocate for themselves, communicate how they’re feeling, and understand what they’re experiencing and why. Exposure to sight words and letters can make literacy lessons in elementary school so much easier, and allows your child to advance to further topics. When you think about it, there’s not a single subject that doesn’t require reading — even math is full of word problems. Most teaching happens verbally — if a child doesn’t understand what’s going on, and doesn’t have the words to express themselves, they’re at risk for falling behind. Reading aloud helps kids learn to read. It might seem obvious to say, but reading aloud is essential to helping children begin reading. Even children who are read to just three times a week have a better sense of phonemic awareness than children who are read two or fewer times. Print is everywhere, and the cognitive benefits of learning to read are absolutely critical. Reading aloud helps you connect. Spending time with your child is more productive and interactive when you’re reading than watching a movie, or giving them the iPad to play with. This activity helps you develop an incredible bond with your child. Engaging in dialogue, asking questions, picking up on what fascinates your child (and what doesn’t) are all ways to help you strengthen your relationship with your child. Reading aloud stimulates creativity and imagination. Images, stories, characters, plotlines — early exposure to all of these things helps your child grow their own imagination and creativity. In the 21st century, problem-solving, creative thinking, and thinking outside the box are all considered high priority skills in the job market. You’re better preparing your child for the future if these skills are encouraged now. Not to mention, having an active imagination and being creative are fun things that make life infinitely more enjoyable! To conclude this post, we go back to one of our first points: after safety and health, reading is one of the most important things that you as a parent can do for your child. Building this in as a routine for your family is fun, engaging, and promotes your child’s early literacy skills that can help them thrive at later points in life. Reading can be the ultimate escape, and getting invested in a great read-aloud with your child is an amazing experience for both of you. Of course, they might want to read the same book six times in a row and you might want to be pulling your hair out, which we will cover in our next blog about read-aloud techniques! Stay tuned, and contact Yellow Brick Road for an educational daycare experience that can’t be matched elsewhere. Early Education in Plymouth, Minnetonka, Maple Grove & Eden Prairie. Contact us to request an enrollment form for your child's quality early education. Our parent community events are amazing. Call us and learn more! We offer quality early education in Plymouth, Minnetonka, Maple Grove & Eden Prairie MN.